On September 3-5, 2016, the Canadian International Air Show took place again over the Toronto waterfront. Photo report by Ron Cembrowski, including the media day held at Toronto-Pearson International Airport (CYYZ), staging base for the airshow's jet display teams. 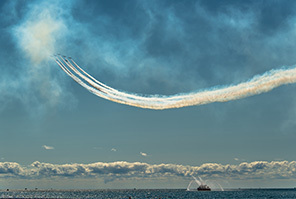 Each year as summer draws to a close, on the last weekend of the Canadian National Exhibition (CNE), the Toronto waterfront sees the return of Canada's longest continuously running air show; the Canadian International Air Show (CIAS). Now in its 67th year, the 2016 CIAS was proud to commemorate the 75th anniversary of the British Commonwealth Air Training Plan (BCATP) and the creation of the first 400 series numbered Squadrons of the Royal Canadian Air Force (RCAF), formed as a result of the BCATP. Military aircraft and jet aerobatic teams stage out of Pearson International and the civil aerobatic acts and warbirds stage out of Billy Bishop airport. This year's Thursday media day was located at Pearson's Central De-icing Facility located north of Rwy 06L-24R and in between Rwys 15R-33L and 15L-33R. This is a great location as the very large ramp area provides ample space for the arriving participating aircraft and plenty of room for photographers and others in attendance. The photos taken during the air show days include the flying display at the Toronto Harbourfront on Saturday, and aircraft arrivals/departures at Pearson International on Sunday and Monday, taken from Rwys 06L, 06R, 24R and 15R. The harbourfront photos from Saturday were taken at Marilyn Bell Park, just west of Ontario Place and the Exhibition Grounds. The Toronto Fire Services fireboat the "William Lyon Mackenzie" is used as air show centre and is in full view from the park. The flying display started at 12:00 PM and ended around 3:00 PM. The BCATP, often simply referred to as "The Plan", was a monumental allied aircrew training program established early in the Second World War by the United Kingdom, Canada, Australia, and New Zealand. The Plan has been recognized as a major Canadian contribution to the Allied war effort. For more information see our BCATP special report. This year's flying line-up included demonstrations by a Beech 3NM Expeditor (Beech Model 18) and North American Harvard; two of the aircraft types that were used during WWII in the BCATP. Over 9000 Beech 18s were produced between 1937 and 1970 with a large number seeing service during WWII as light transports, air crew trainers, and in the photo-reconnaissance role. The aircraft were used by the United States Army Air Force (USAAF), the United Stated Navy (USN), the RCAF, and the Royal Air Force (RAF). The Beech 3NM Expeditor seen at the air show (C-FTLU) is a privately owned aircraft based in Woodstock, Ontario, and is the navigation trainer variant of the Beech Model 18. This particular aircraft was built in 1952 and saw post-WWII military service with the RCAF from April 12, 1952, until July 7, 1967. The Harvard flying at the show (C-FMKA) is a privately owned Mk II model also based in Woodstock, Ontario. 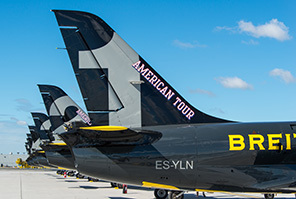 The aircraft is painted in the classic "yellow wings" military colour scheme as seen on trainer aircraft used in the BCATP. This Harvard MkII was manufactured in 1941, in the United States, and was flown by the RCAF between July 8, 1941, and August 25, 1960, when it was finally retired from active military service. At one time during WWII it served with 14 Service Flying Training School (SFTS) in Aylmer, Ontario, one of the many flying training schools operating in the BCATP. For the second year in a row the 2016 CIAS was fortunate to have the Breitling Jet Team attend, flying the L-39C Albatros training jet. Based in Dijon, France, this prestigious aerobatic display team is the world's largest professional civilian aerobatic formation jet team. It is comprised of seven highly skilled pilots and associated maintenance crew. Many of the members are former military pilots. The team was scheduled to repeat much of its 2015 debut North America tour making a total of 15 appearances this year, two in Canada and thirteen in the United States. Also celebrating their 75th anniversary this year (1941 - 2016) is the Air Cadet League of Canada. The Air Cadet League of Canada is a civilian, non-profit, community-based and volunteer-led organization that operates in collaboration with the Department of National Defence and other partners. The League offers young Canadians ages 12 to 18 the opportunity to increase their knowledge of aviation, including flight and ground crew training. The league has been an inspiration to thousands of Canadian pilots, including senior Canadian Forces officers and Canadian Space Agency astronauts. The Air Cadet's flying display included the Bellanca 8GCBC Scout tow-plane and the Schweizer 2-33 Glider. Both of these aircraft are used in the cadet flying training program. The RCAF presented the CF-18 Demonstration Team. This year's CF-18 demo pilot is Captain Ryan "Roid" Kean of London, Ontario. The 2016 Demo Team theme is "Training for Victory". 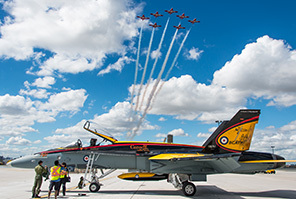 The 2016 CF-18 Demonstration Hornet paint scheme is styled after the high visibility "Yellow Wings" trainers used in the BCATP during WWII. For more information on the paint scheme, see our 2016 CFB Borden air show report. One WWII warbird making an appearance at the CIAS was the Grumman Aircraft company designed Avenger. The Avenger was a carrier based torpedo bomber and anti-submarine aircraft. It was used extensively by the USN and the Royal Navy (RN) during WWII, in both the Pacific and the Atlantic theatres. By the end of WWII over 9800 Avengers had been built by Grumman Aircraft (as the TBF Avenger) and under contract by General Motors Eastern Aircraft Division (as the TBM Avenger). The Avenger flying at the show (N3967A) is operated by "YakAttack Airshows". The group was founded in 2008 and is an international team of pilots (Canadians and Americans) that perform at air shows in Eastern Canada and Northeastern United States. YakAttack fly a variety of aircraft types including the Chinese CJ6A Nanchang, the Russian Yakovlev Yak-52, the Czech L-29 Delphin, and American TBM Avenger. In addition to the CF-18 Hornet commemorative paint scheme the RCAF also had one of their CT-156 Harvard II (156120) trainers painted in a representative BCATP "Yellow Wings" colour scheme. The aircraft is overall yellow and is displayed in the markings of a WWII North American Harvard flown by Pilot Officer (P/O) John Gillespie Magee, Jr., during his training at No.2 Service Flying Training School (SFTS) at Uplands, Ontario, in June 1941. P/O Magee is best known as the author of the poem "High Flight". 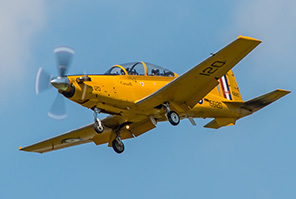 For more pictures of the yellow CT-156 Harvard II take a look at the CFB Trenton air show report. Back once again to the CIAS was aerobatic pilot Mike Wiskus, flying the Pitts S-1-11b Special, sponsored by Lucas Oil. A U.S. National Aerobatic Champion and dubbed "an Honourary Canadian", Mike obtained his pilot's licence at age 17 and now 38 years later has accumulated more than 24,000 flight hours and is qualified in more than 40 aircraft types. His awe inspiring flying display has made him a CIAS favourite. From 8 Wing, CFB Trenton, 436 (Transport) Squadron supplied a C-130J Hercules to perform a tactical demonstration. The C-130J is one of the RCAF's newest transport aircraft acquisitions. The aircraft tasked out of Trenton each day for its flying display. 424 (Transport & Rescue) Squadron also based at 8 Wing, CFB Trenton performed a Search and Rescue (SAR) demonstration using one of their CH-146 Griffon helicopters. The SAR demo featured a water rescue of a simulated casualty. The U.S. Navy Tactical Demo Team made another welcome appearance at the CIAS this year, flying the F/A-18F Super Hornet. The Demo Team is made up of pilots and crew from Strike Fighter Squadron 106 (VFA-106 "Gladiators") based at Naval Air Station (NAS) Oceana, Virginia. The squadron is responsible for training naval aviators and maintenance personnel on the F/A-18 Hornet and Super Hornet. Training includes air-to-air and air-to-ground missions as well as day/night aircraft carrier qualification. The air show always concludes with Canada's military aerobatic team, "The Snowbirds". Based at 15 Wing, CFB Moose Jaw, Saskatchewan, and officially know as 431 (Air Demonstration) Squadron, the Snowbirds continue to inspire all those fortunate enough to witness the flying skill and professionalism that is the RCAF and the Canadian Forces. The 2017 Canadian International Air Show is scheduled for September 2-4. For more information please visit the CIAS.org website. A special thank you is owed to Colleen McCourt, Manager of Public Affairs and Media Relations, CIAS, and to the volunteers for their kind support during media day.